You can't celebrate Independence Day without fireworks! We're enjoying a spectacular 4th of July fireworks show a little early thanks to the homemade pasta noodle fireworks hanging from our dining room chandelier. 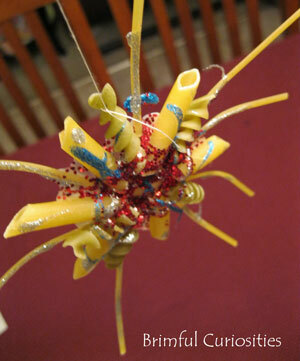 The pasta fireworks sparkle as much as the real deal, and they are a whole lot quieter and safer. Squirt a large circle of glue on a piece of wax paper. 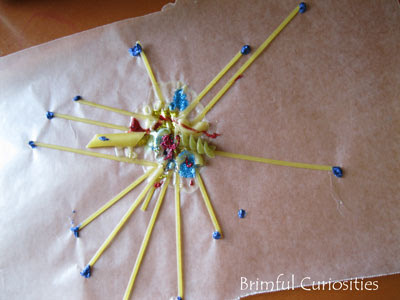 Create an exploding fireworks shape by positioning the pasta partially in the glue to make a pattern radiating outward from the center. Use different lengths and types of pasta to add dimension. 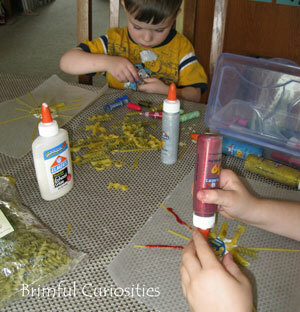 Sprinkle glitter on the fireworks and/or use a little glitter glue to add some sparkle. Allow the pasta fireworks shape to dry fully before peeling off the waxed paper. (Ours took about two days to dry.) 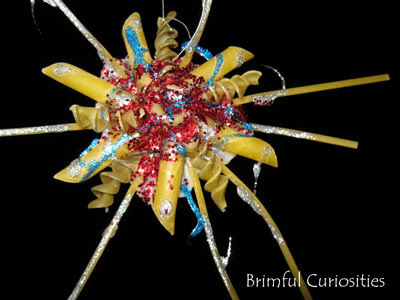 If you want to hang the fireworks decoration, tie a piece of string to one of the noodles. For a little nighttime fun, try photographing the pasta fireworks against the dark evening sky. Capturing the pasta fireworks on camera is a lot easier than trying to photograph actual fireworks! Last year we featured our favorite children's picture book containing fireworks ... Olivia Forms a Band by Ian Falconer. Since then we've discovered several other books that portray a fireworks show. It's amazing how many different ways illustrators depict a fireworks display. Our book list is a work in progress. 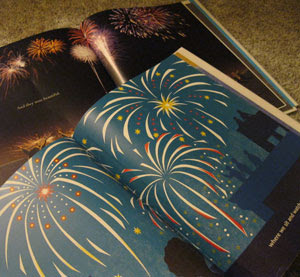 Do you know of any other books with illustrations of fireworks? I love your pasta fireworks! The craft, however, I think I will do with the little kids of this family. oooh, I love these! I wonder if we can squeeze them in this afternoon so they'll be ready for the 4th! I pinned this! Thanks for linking to Favorite Resource This Week! I was making a small display at the library where I work of Fourth of July books...two that might interest you are McDuff Saves the Day by Rosemary Wells and Fourth of July Bear by Kathryn Lasky. The craft project looks like fun! I bet these would make nice ornaments for Christmas. Just use silver, gold, and sparkly white glitter in place of the red and blue glitter. 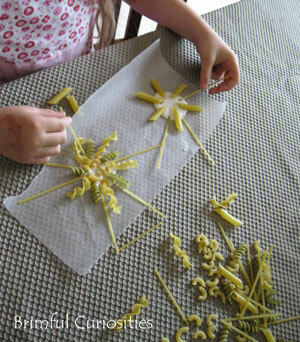 I love this pasta craft.Very pretty! Wow, these turned out really cool! Love the craft and thank you for the list of fireworks books! I'll have to keep them in mind for next year.